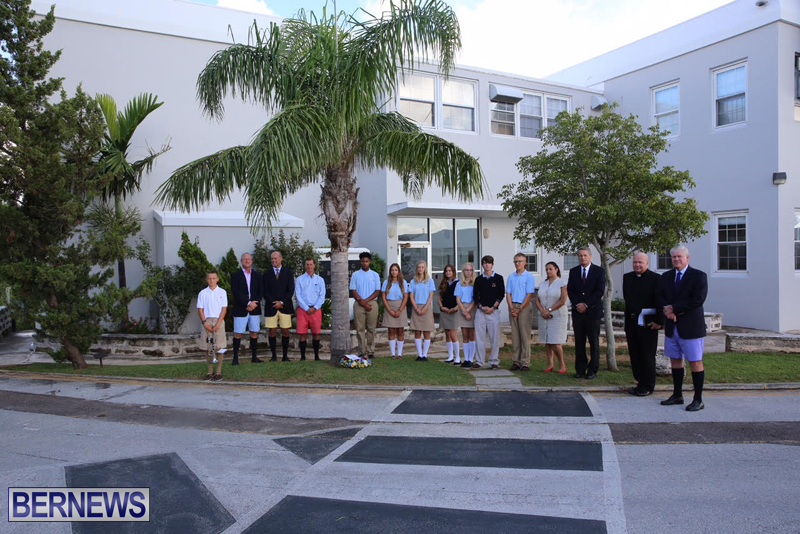 This morning, Saltus Grammar School remembered those who perished in the terrorist attacks on the World Trade Center on September 11th, 2001, including Saltus alumni Boyd A. Gatton [1962-2001] and Robert D. W. Higley II [1971-2001], as well as Bermudian Rhondelle Tankard. Deputy Head Jon Beard, who taught Mr Gatton, said: “The terrorist attack on the World Trade Center on September 11th of 2001 claimed the lives of 2,606, and among that number were Rhondelle Tankard, Boyd Gatton and Robert Higley. The ceremony took place by the memorial tree in front of the Saltus Secondary Department’s Dudley G. Butterfield Library Research Centre. Canon Norman Lynas recited the Psalm 46 and said a prayer with the following words: “Console those who continue to suffer and grieve, and give them comfort and hope as they look to the future. May the memories of their loved one’s give them strength and may your presence give them courage. S9 student Alexander ‘Zander’ Miller played “Taps”. Also part of the remembrance ceremony were alumni Brian Patterson and Jay Correia who knew Mr Gatton, Saltus Trustee Dominic Powell and Deputy Head Nicole Chichon –De Silva. Attendees also heard from alumnus Sean Moran who was working close by the World Trade Center at the time. Following is his account of the tragedy: ”On every September 11th since 2001, I wake up with a heavy feeling in the pit of my stomach, and I spend some time reflecting on that day in New York. Coming into the office that morning, excited to tell my co-workers about the Michael Jackson concert I’d seen the night before. “The ‘boom”‘of the first plane hitting the North Tower while I was on a call at my desk, then turning around to see the black smoke coming from the building. The sight of the second plane appearing in my peripheral vision as I stood looking out my window; seeing it disappear behind another building for a second, then reappearing and flying directly into the South Tower; witnessing the explosion on impact and seeing fire and debris flying out the other side of the building. The awful feeling of realization that this was not an accident but a terrorist attack. “The horror as I watched the first tower collapse, hearing the rumble and feeling the ground quake as it happened. Catching a colleague as she fainted. Hoping that the co-workers who had left earlier had not been killed. Evacuating the building, only to be sent back inside because the smoke at street level was so thick you couldn’t see or breathe. The disbelief as I watched and felt the second tower fall, and the numbness that followed. “Knowing that thousands of people had died in those buildings as I watched, not to mention on the ground around them and on the planes. Holding hands and saying a prayer with remaining co-workers as we all left the office, not sure if we’d ever see each other again. Going with some colleagues to the NYU Medical Center to see if we could offer any assistance; leaving after an hour because it was clear we weren’t going to add any value. “Walking home from downtown, covered in dust, with thousands of other people, the only sounds being helicopters and sirens. Stopping in Chinatown to cry. Getting back to my apartment on 16th Street and turning on the TV, which stayed on around the clock for the next week. “The many, many posters of missing people plastered on the outside walls of St. Vincent’s Hospital, and the crowds of people waiting there for news of loved ones…putting faces to the unthinkable losses felt by so many families. I will never, ever forget the events of that day 15 years ago. 9/11 changed me forever. I’ll shed some tears this morning, but then I’ll go outside, breathe in the air, and appreciate my life, my friends and my family in a way that, I hope, honours those that were lost”. Yesterday morning, a wreath-laying ceremony was held at the 9/11 Memorial in the Botanical Gardens this morning, with remarks by Acting Governor Ginny Ferson, Deputy Premier Bob Richards, and U.S. Consul General Mary Ellen Koenig.